Cancer Victory Gardens™: Watch your garden grow! 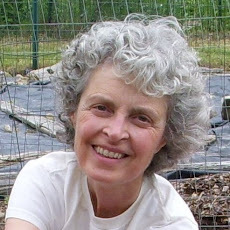 I am not sure how I stumbled on to this great web site, but The University of Illinois Extension has developed a very helpful website called "Watch Your Garden Grow" that gives beginning gardeners all the information they need to get started with some commonly grown vegetables. I loved the page that has the individual vegetables listed by picture, then just click to get the info all compiled in one place, from spacing to problems (insects, etc) to recipes to home preservation directions. Just skimming through a couple of them I learned that (1) swiss chard is really a beet that has been bred to minimize the root storage form in favor of the beautiful and tasty leaves and (2) collards are often called 'tree cabbage'. This is a great web-based resource! I'm sure there are many many many more. As I find them, I'll keep posting these treasure troves of information and inspiration. Tonight I'm making soup using my own treasure trove of stored, canned, and frozen vegetables from last summer. It is beautiful using vegetable stock and canned tomatoes as a base, then adding corn, chopped multi-colored sweet peppers, garlic, sweet potatoes, and kale. I've also added some barley and red lentils and curry powder. Served with some locally-made bread and some of our home-made applesauce, the memories of last summer and anticipation of a great meal are just a few of the great ways that growing your own food can cultivate health. 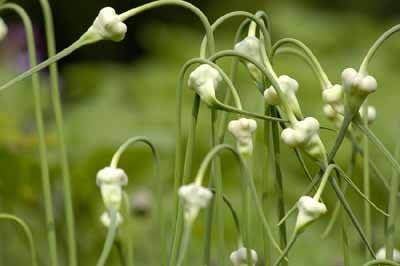 While not the first crop to be ready, garlic scapes (from garlic cloves planted in the previous fall) will be harvested in June before the garlic bulbs are ready to be dug up and dried in July. I can't wait! What are you looking forward to eating that is grown in your garden?